"Where do you find ideas for your pages?" 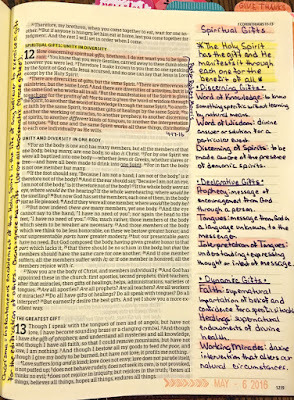 "How do you decide what to journal in your Bible?" 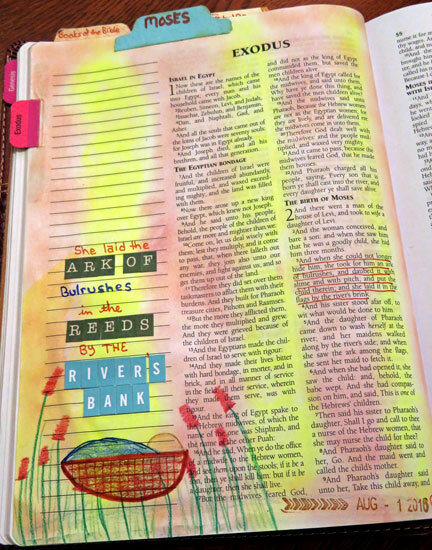 These are two of the questions I've been asked in my illustrated Bible journaling workshops, and it's an easy one to answer because there are quite a few places where I find INSPIRATION for journaling. I've shared in previous posts about INSPIRATION from online classes, participants in my workshops, coloring pages, and online challenges. 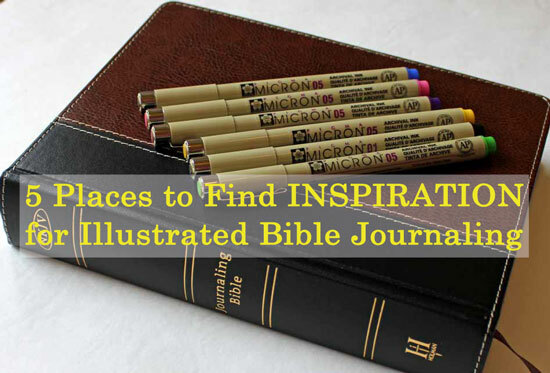 Today I'm sharing the top five places I find INSPIRATION and ideas for what to journal in my Bible. One of the best things about attending a Bible preaching church is hearing the Word shared, explained, and applied during sermons. I've been a note-take for many years, however I often found that I didn't go back through those notes and did not have a way to help me remember and apply the important points. Now I take time to review those notes, look up the scriptures, and spend time with the Lord and my journaling Bible. Sometimes I want to record lots of notes, like I did with a sermon explaining spiritual gifts. Spiritual Gifts - I used a Micron pen to add lots of journaling to this page and colored pencils to highlight the scripture and keys points in the notes. Other times I simply want to record one point that really spoke to me, like when I heard Dr. David Shibley from Global Advance share the idea (based on Matthew 9:4-5) that we must do what we can now to share the Good News of Salvation because night is coming. 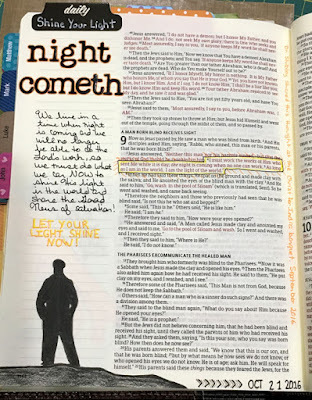 Night Cometh - I used black letter stickers, outlined with an orange Micron pen for my title, then boxed in the scripture and added journaling with Micron pens. 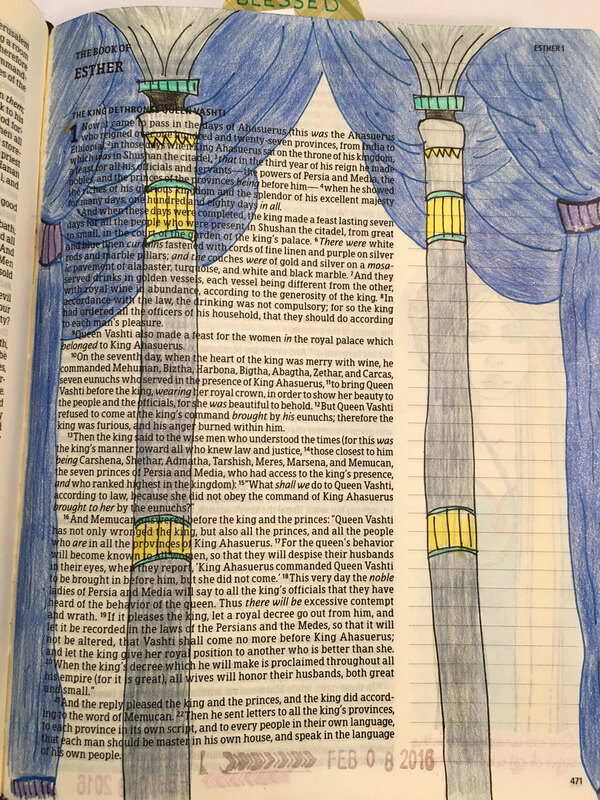 The illustration was traced using the Illuminated Journaling One and Done Favorites. I enjoy Bible studies and have participated in many in-person classes over the years. I've also worked through Bible studies on my own. Recently, I've enjoyed the convenience of online studies. One of the lessons in The Amazing Power of Grace Bible Study focused on the woman caught in adultery. This story is such a powerful reminder that we are all sinners, saved only by the grace of God. Let's not throw stones at others! Throw First Stone - I traced the hand from a sketch I found online and cut the stone from a piece of patterned paper. 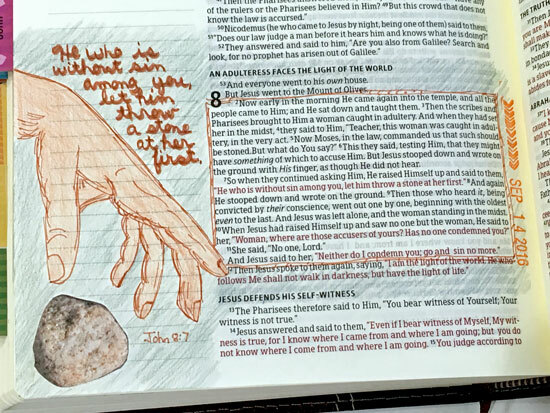 The current study from The Time-Warp Wife is on Exodus, and I recently illustrated Chapters 1 & 2 after reading these scriptures and working through the study materials. 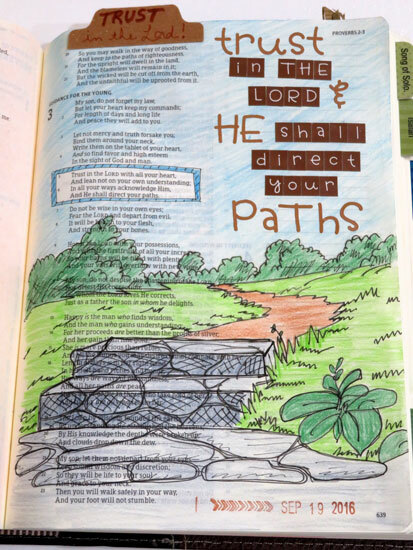 Exodus 1 & 2 - I used a variety of letter stickers to emphasize one of the main points of Chapter 1, then drew and colored the illustration of Moses in the bulrushes using Micron pens, Zig markers, and colored pencils. I also find INSPIRATION when I read a devotional. 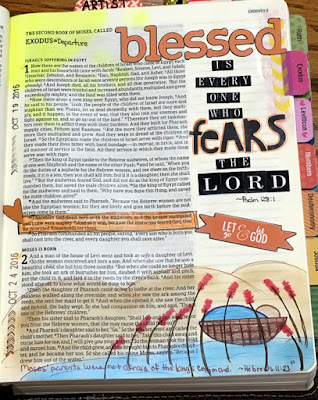 Illustrated Faith offers monthly devotional kits for Bible journalers. 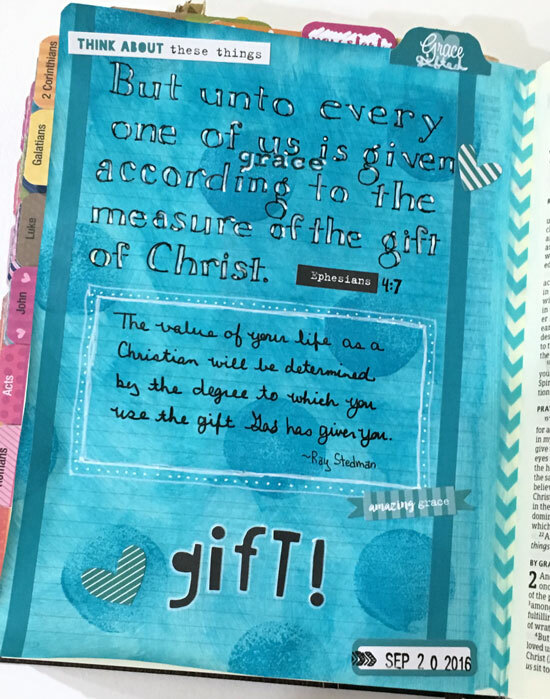 These devotional kits come with a devotional booklet, stamp pad, clear stamps, washi tape, and other bits & pieces. 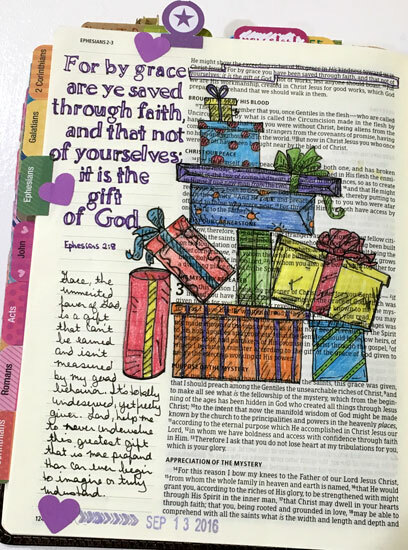 Gratitude - Most of the bits and pieces and stamping for this page came from the Created to Create Illustrated Faith devotional kit. Sometimes the INSPIRATION comes from a devotional that I've written to share at a class or event. This page was created for a devotional focusing on examples of faith in the book of I Samuel. HERE I AM - I used watercolors for the outline around this page, then added Illustrated Faith letter stickers and stamped hearts. Of course, scripture itself is a primary INSPIRATION for what to journal. The themes of prayer and joy in the book of Philippians inspired this page. 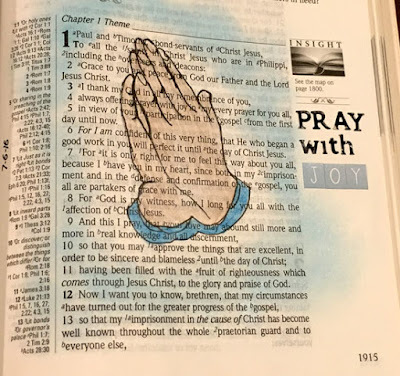 Pray with Joy - I traced the praying hands from a sketch, then used a blue Gelato to add the frame. 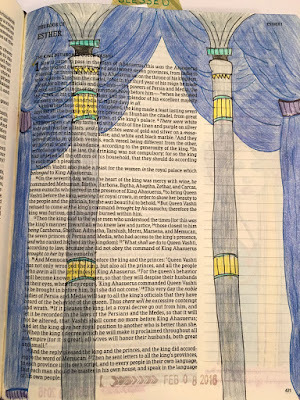 In the book of Esther, the first chapter describes the scene in the palace as it sets the stage for the rest of the story. Setting the Stage - I traced this image from a coloring page, then finished it with Micron pens, colored pencils, and a clear Wink of Stella pen (to add shimmer to the curtains). 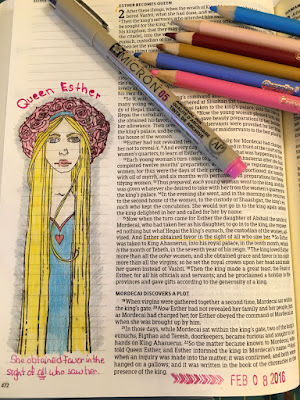 Occasionally the INSPIRATION for a Bible journaling page begins with the product, like the Creating in Faith Esther stamp. If you've been reading my blog for awhile, you know that Esther is one of my favorite books, so I was excited to pick up this stamp and use it in the margin of my Bible. The one thing that always intrigues me about Esther is that she "obtained favor in the sight of all who saw her" (Esther 2:15). Think about it . . . all who saw her . . . this means she found favor with the men and the women, the young and the old, the servants and the king. How many women do you know who find this kind of favor from everyone? Obviously it wasn't just Esther's physical beauty that drew others to her. (Let's be honest, we often feel intimidated by or jealous of beautiful women and avoid them rather than extending them favor!) Esther's inward beauty (humility, obedient spirit, faith in the Lord) must have shown through. 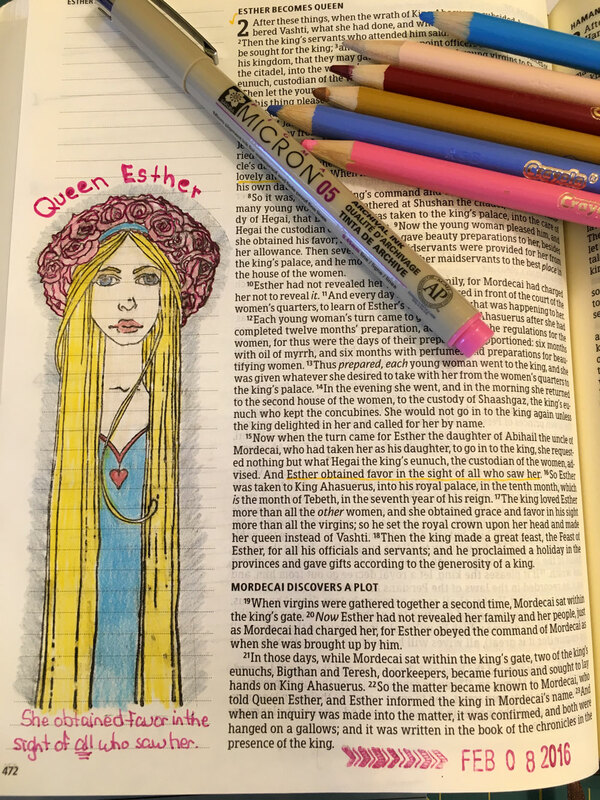 Queen Esther - I used the Creating in Faith Esther stamp on this page. I filled it in with colored pencils and added my journaling with a Micron pen. There are so many inspirational stamp sets on the market these days, many of which contain scriptures and encourage me to mediate on a particular passage as I journal it in the margin. All Things - I used an Inky Antics stamp set and Powder Puff chalk inks to create this illustration, then filled in and highlighted some areas with colored pencils. 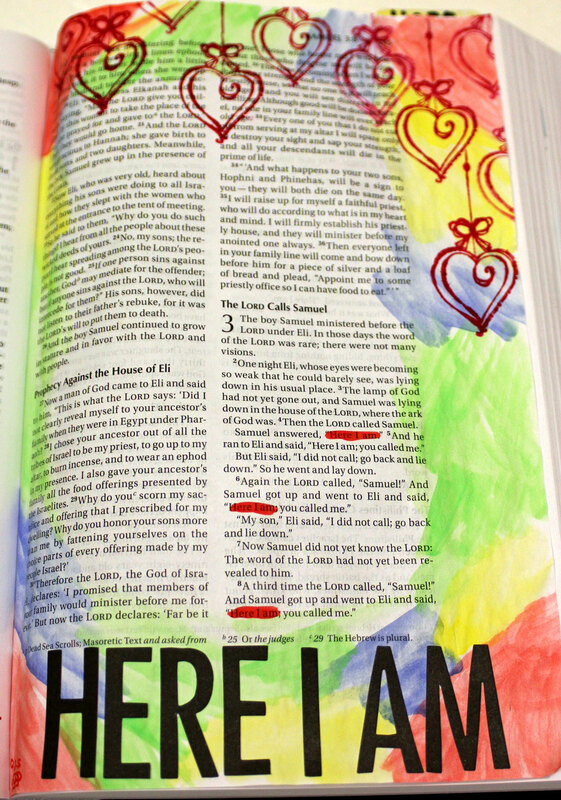 I have to admit that I'm rarely at a loss for journaling INSPIRATION when I sit down with my Bible! There are so many places to find ideas to record and spend time thinking and praying about. 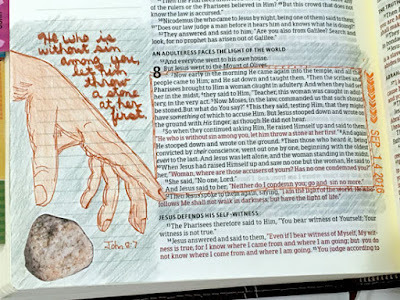 Where do you find ideas for illustrating in your Bible? In a previous post, I mentioned that I'd attended an event put on by The Collins Group, a manufacturer's sales rep group for a host of companies including Ranger, Sizzix, Bo Bunny, and Bella Blvd. Along with the two projects I shared in that post, we created several other projects and enjoyed a couple of demonstrations. We used Wow! embossing powders to create this Faux Enamel Card. 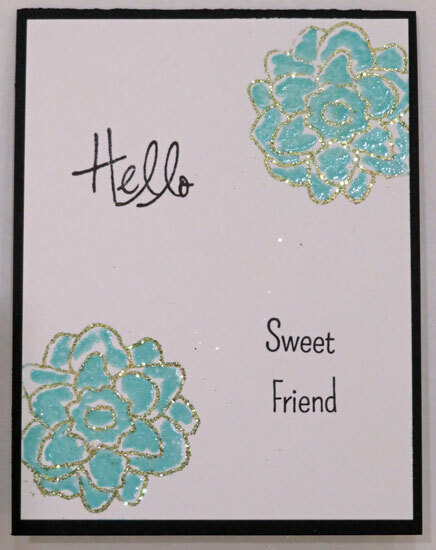 I really like the way the embossed flowers look - shiny and dimensional! This Ken Oliver Stitched Water Color Card was created using Color Burst with a water brush, along with die cut stamped images. I'm not sure that my color choices were the best, but it was FUN to try these products. I added a stamped sentiment to the card before I sent it off (but forgot to snap another photo). We used one of my favorite products (Gelatos!) 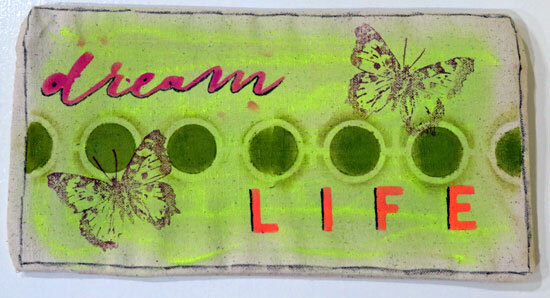 along with stencils, inks and Pitt artist pens to decorate Canvas Corps pouches. This would be a FUN way to decorate an apron, too! 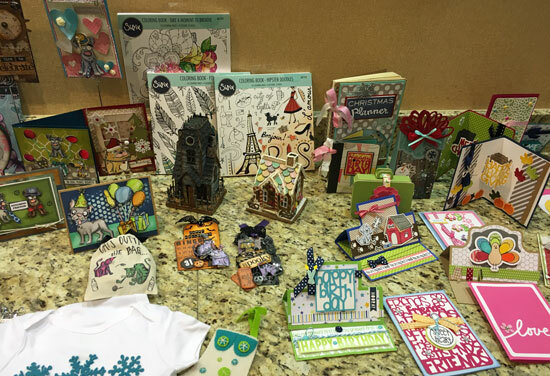 A representative from Sizzix discussed and demonstrated some of the new Sizzix products. This display shows just a portion of the sample projects they had on display! I especially liked the Tim Holtz gingerbread house! We were also treated to a demonstration of the Ranger Dylusions Acrylic Paints by Dyan Reaveley herself! 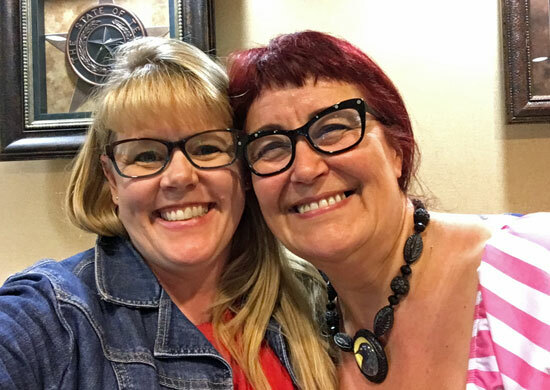 Dyan is a wonderful speaker and shared tips on how to choose between her paints (fluid acrylics), Tim Holtz's paints (distress paints), and Dina Wakley's paints (heavy body acrylics). I captured some of her demonstration on video. This was a FUN event. 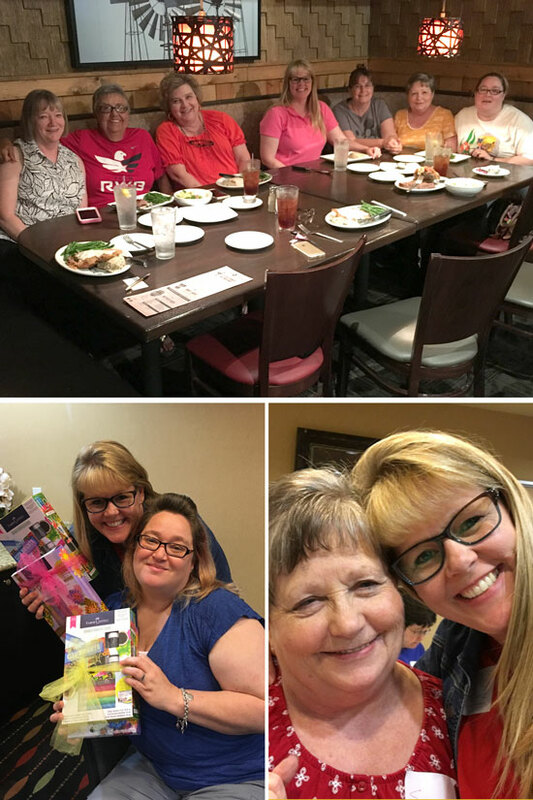 I'm so glad Candi, the owner of Personal Scrapbook, invited me to attend with her. We also enjoyed spending time with Susie, the owner of Scrappin' Goodtime, Dana (one of Scrappin' Goodtime's new design team members), and several other store owners from around the state. Dana and I even won Gelato door prizes! 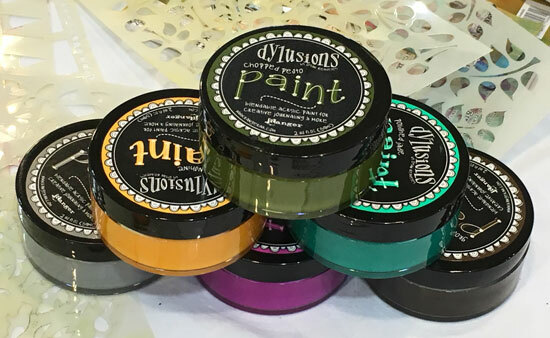 Have you attended any FUN events with product demonstrations and crafty projects lately? As I've mentioned often, I really cannot draw well. 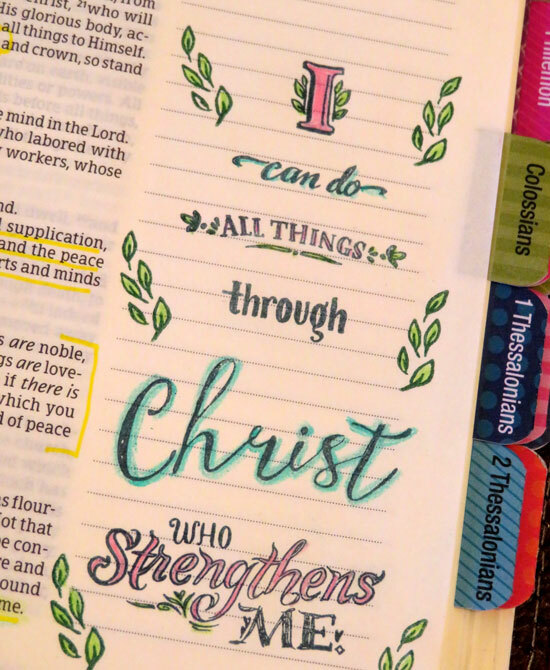 That fact doesn't mean that I never draw in my Bible. 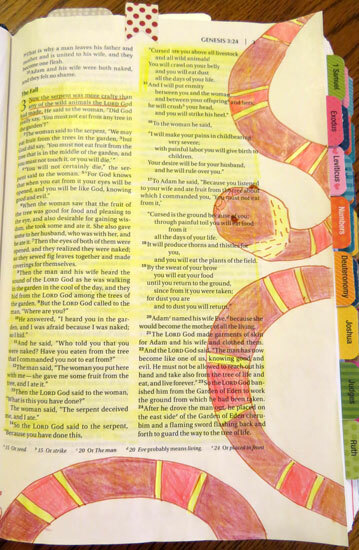 In fact, a couple of months ago, I drew a serpent beside the story of The Fall in Genesis 3:1. I also recently illustrated the beginning of Moses' story by drawing the "ark of bulrushes in the reeds by the river" (Exodus 2:3). However drawing is rarely my first choice when adding an illustration. Tracing a picture someone else has created is a much better option; one made easier by the abundance of illustrations available online. I've recently been working through the Amazing Power of Grace Bible Study hosted by the Time-Warp Wife website. This study comes with lots of free downloads - a study guide, week-at-a-glance pages, weekly study questions, scripture cards, and coloring pages! Here's a look at how I've used a couple of those coloring pages. I printed, cut apart, and traced the Week 1 Part 1 coloring page to highlight the fact that grace is a gift as described in Ephesians 2:8. For the scripture in the margin, I simply put the printed piece underneath the Bible page and traced the letters using a Micron pen. For the gifts, I placed a piece of graphite paper on top of my Bible page, then layered the gifts coloring piece on top (both pieces held in place with a small piece of washi tape) and traced over the picture with a pencil. After removing the coloring page and graphite paper, I traced over the graphite using a black Micron pen. Then I simply used some Crayola twistables to color in those beautifully wrapped presents. To complete this page, I added some handwritten journaling, three punched hearts, a tab, and a stamped date. I cut apart the Week 1 Recap coloring page to use on two separate pages. I traced the picture as an illustration for Proverbs 3:5-6. Once again, I used graphite paper and traced over the picture with a pencil. Then I went over that with a Micron pen before coloring it all in with colored pencils. 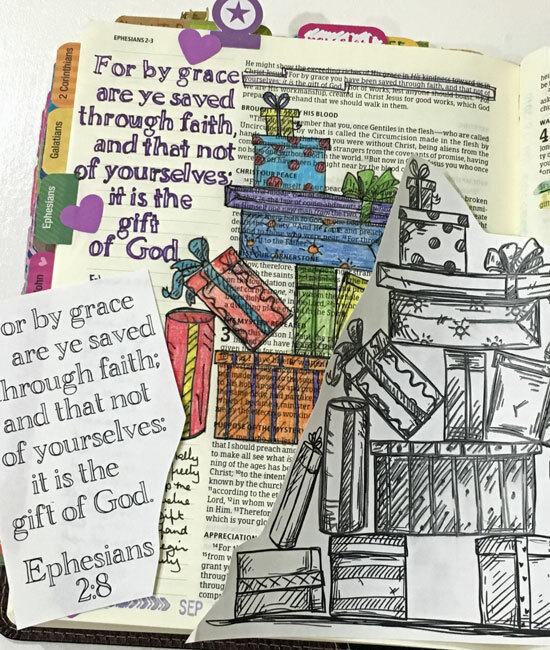 I didn't trace the scripture from that coloring page, however I used it as INSPIRATION for writing out Ephesians 4:7 on the blank page before the book of Ephesians in my journaling Bible. First, I painted the background with Dylusions paint. 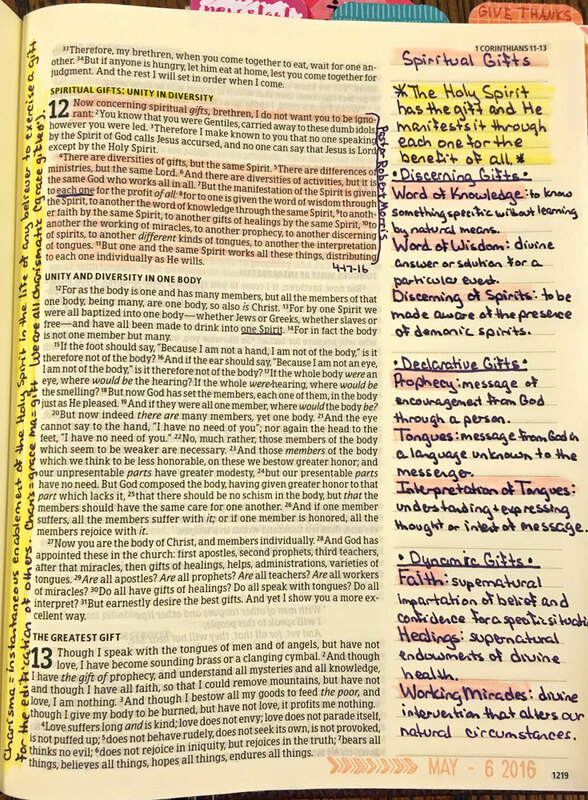 After writing the scripture and a Ray Stedman quote (that our pastor had shared in a sermon), I used a white paint pen to add highlights. I also included some washi tape, stickers, a tab, and a stamped date on this page. As you can see from these pages, the traced illustrations are far superior to my own drawings. 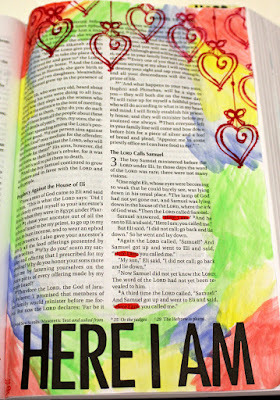 However, in each case I've spent time in the Word, which is the most important part of Bible journaling. Have you done any tracing or coloring lately? We're closing out the first week of October with a gray rainy day here in Texas. It's the perfect kind of day to stay indoors and do some blogging and reading! After our long weekend trip at the beginning of September, the remainder of the month was primarily spent setting up my new craft room and planning, preparing and teaching classes and workshops - all of which helped the progress on my 2016 goals (MOVE, LEARN, TEACH, SCRAP, CLEAN). MOVE - I didn't push myself to exercise much in September, but I did get lots of activity as I moved furniture and supplies into the new craft room! This month I'm back on track riding the stationary bike most days and hope to get out for some walks in the neighborhood now that temperatures are down in the 80s. LEARN - I participated in a Productivity Webinar in September and was inspired to read Getting Things Done by David Allen. I learned and was reminded of several tips for efficiently and effectively accomplishing the things that must be done in order to enjoy more of the things I want to do. This month I'll be putting some of the ideas into practice, and I'll be sharing more on this topic in a future blog post. 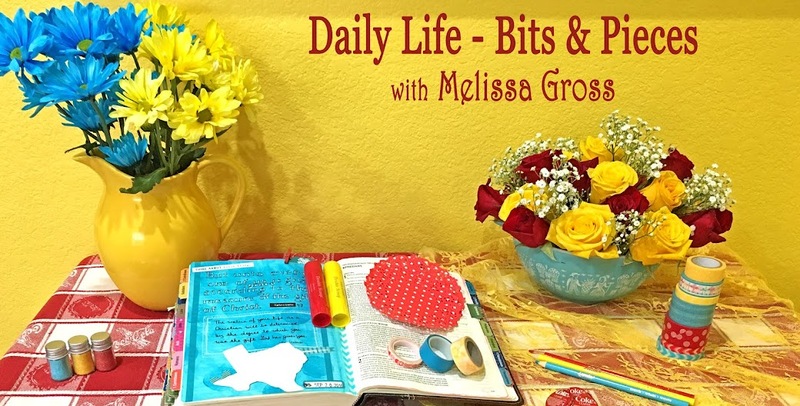 I'm also planning to attend a couple of in-person classes this month - a DIY class at our local library and an Illuminated Bible Journaling Workshop at a church in Dallas. 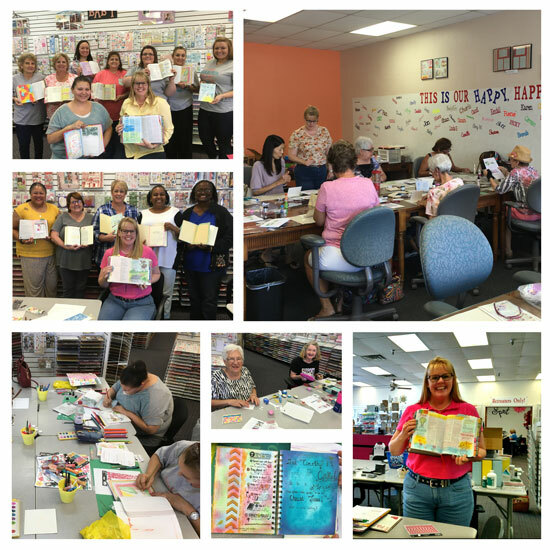 TEACH - I taught several classes in September (& the 1st of October) - four card classes and three Bible Journaling workshops. As always, I had a fabulous time! 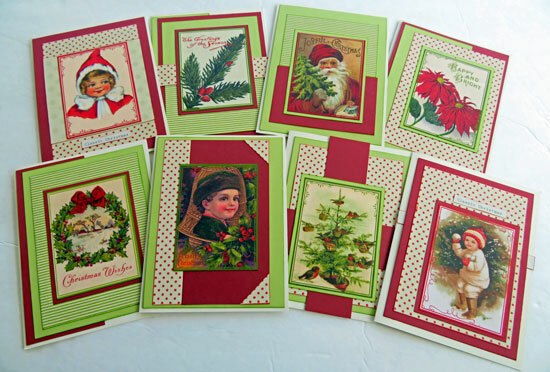 Later this month, I'll be teaching more Bible journaling workshops as well as a Classic Christmas Cards Class using Authentique's Classic Christmas Collection! 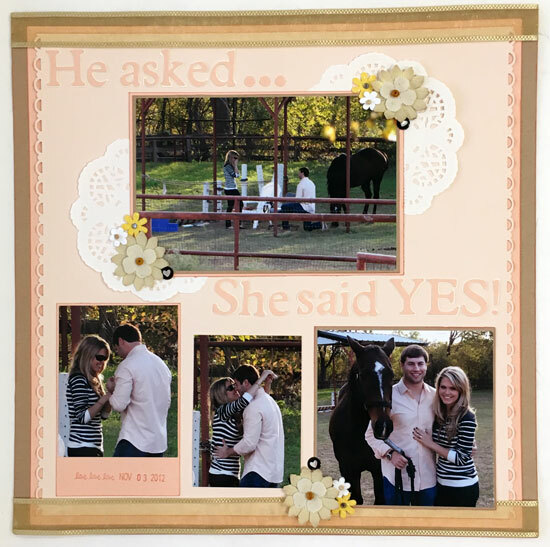 SCRAP- I did not do any personal scrapbooking in September, however I did create the first few pages for a custom wedding scrapbook-for-hire project. This month I will be completing this album and starting on a second wedding album for the same client. I also recently ordered some photos from this year that I hope to scrap for our 2016 chronological album. CLEAN - With all the progress we've made moving into my new craft room, the front room is now ready to be put back in order. This month I'll be cleaning, decluttering and rearranging that room as well as painting Grandma's sewing table. Did you accomplish your goals for September? What are your plans for October? The last couple of months have been pretty busy around here, and I missed my round up post in August. So, today I'm catching up by sharing some of the comments on my blog from August and September. I haven't joined in with Helena's meme - Snap as often as I'd hoped to this year, but when I have, I've often posted more than a visually linked set of between 2 and 4 images... based on colour or shape or subject. In my Snap 13 - Museum Artifacts, Bells & Antique Mall Booths post, I actually shared three sets of snaps, so I was glad when Maggie and Miriam both admitted to "breaking the rules" too! On that same post, Sian commented...Wow! So many things to look at. It's lovely to have photos to bring home and enjoy..round here we aren't often allowed to take pictures in exhibitions (Though I guess the advantage is that I get to feed my postcard habit). We have lots of places that don't allow pictures also, as well as many that do, so I make sure to check the brochure or ask when I purchase a ticket. Typically photography is allowed only without a flash. I always find it interesting to see comments that reflect the different topics that catch reader's attention. My Road Trip post received comments about (1) the layout, (2) the photo, and (3) road trips. About the layout, Barbara said...I love all the little details on this first layout. I really like the bit of doily and filmstrip at the top of the page and repeated throughout the page. The colors are perfect for an Americana type page without looking too patriotic. Ciska said...I love your LO, such vibrant colours and the map for a background really works well, and Ruth said...I love this! I may have to scraplift. About the photo, Karen said...the map is such a perfect background for your FUN photo! About road trips, Sian said...You are right: there is such a difference between driving and flying. I'd take a road trip every time. And Missus Wookie said...I love a road trip, definitely willing to go anytime. It is one of the reasons I need to learn to drive so Wookie doesn't end up doing it all. In response to my Build It layout that showcases photos of the shelf units we've built as we're rearranging the house, Missus Wookie said...We build - but then we have quite a selection of basic wooden shelves/uprights from IKEA to work with too. So even those we buy we often adapt in some way. We definitely have a mix, too. 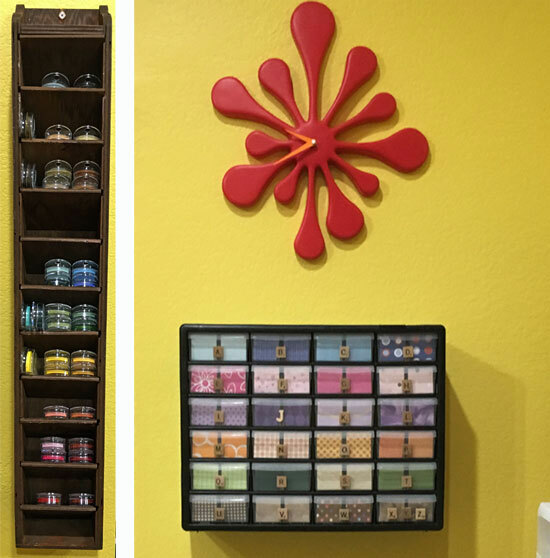 Some we build, some we've picked up at IKEA (like the red Expedit unit in my craft room), and some are a hybrid (like these wall mounted shelves that Robbie hung last week using supplies from Lowe's home improvement store). When I mentioned in my Memorandum Monday - Olympic Games post that I was thrilled that the teams entered the Opening Ceremony in alphabetical order in the Portuguese language (because the US was much earlier in the list), I had no idea (as Sian commented) that it was reported at length in the newspapers here [UK] (and may very well not be true!!) that the USA had put a lot of pressure on the Olympic committee to let the teams appear in that order so that it would be on early! Sounds like a media story to me. 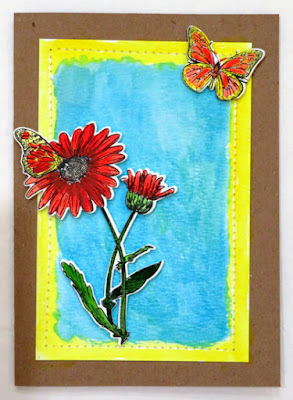 When I shared my July Gratitude Journal pages, Cheri said...I love seeing your pages for this journal come together - and how our styles are/were similar and yet totally unique. Cheri used the same Memory Planner album last year and it was her pages that inspired me to give it a go this year. Thanks for the INSPIRATION Cheri! Karen said...Every time you post these, I feel guilty that I fell off the gratitude journal wagon this year, and every time I promise myself that next month I'll get back on! Yours is wonderful. Oh no, there's no guilt allowed in FUN crafty projects! My feeling is that anything you've done is worth it, even if it's not complete. Every time we record a story or a list of things we're grateful for, we are preserving memories and leaving a legacy! On my La King's Confectionery layout, Karen loved the quote under the journaling. I actually cut that quote from the bar code strip from a piece of Authentique paper. The Authentique papers often have a quote on that strip, and it's so FUN to use something that might otherwise have been thrown away. 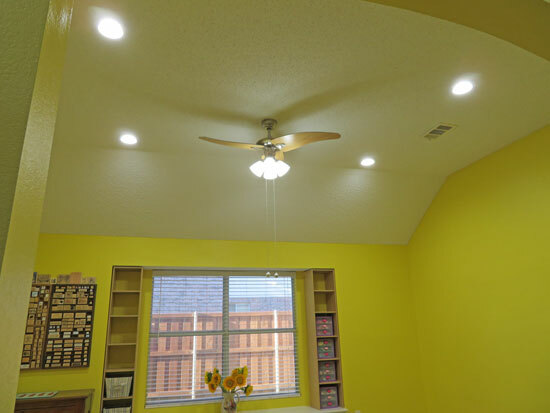 When I shared the wall color (Forsythia Blossom) in my new craft room, Karen wondered...That's one bright craft room! I'm wondering if it influences colors at all. I have to admit that yellow walls do sometimes influence colors. However, this new room is larger and much more open than the old room, which makes a big difference. Also, we installed all new light fixtures with daylight bulbs to minimize the added yellow effect from other bulbs. 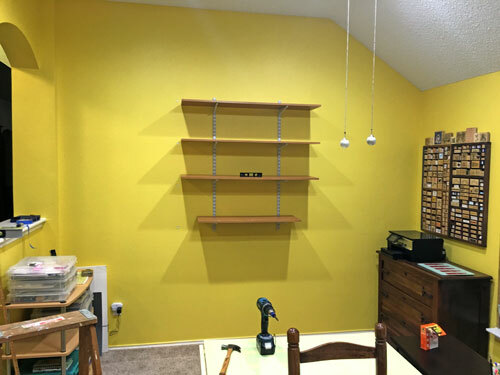 Of course, since yellow is my favorite color, I have to agree with Alexa that there's loads of lovely sunshine in your craft room already. I can't imagine having too much sunshine! 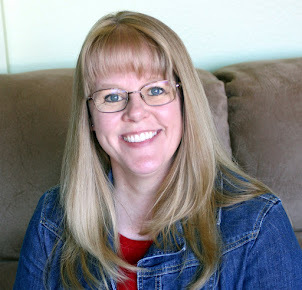 After seeing my Project Shelf, Nancy said...Great post, Melissa! You are beautifully organized! I'm in major overhaul mode right now and plan to use your system for my projects as well! Thanks for the inspiration!��xoxoxo It makes me so happy to know I've provided some INSPIRATION for organization! The progress we've made on my new craft room elicited lots of comments. LeAnne said...It's looking Awesome!!! Cant wait to scrap in there :). 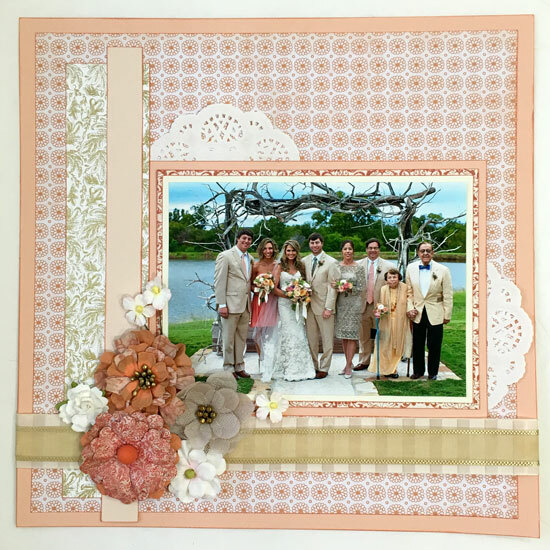 I'm looking forward to LeAnne (who also lives in Texas) joining me for some FUN scrapbooking, too! Susanne's comment made me laugh out loud...Maybe when the sewing table is painted red, you can whip up a little red valance for top of the blinds too - I can see it now - cute red whimsical print. (Says the woman who can't sew a lick, and should keep her mouth shut.) Great idea Susanne - I'll mention it to (a wonderful seamstress/sewer/quilter) Mama and see if she gets inspired to make me one for Christmas! Ruth said...Good luck! Reorganising my craft space is the next big job on my list (most likely early next year now). And Alexa asked...I'm fascinated by the collection on the wall to the left of the window. Are they boxes? Stamps? 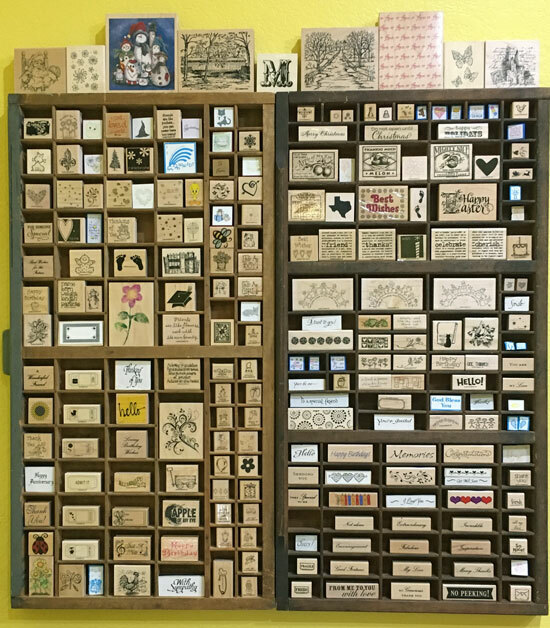 Those are old printer's drawers filled with wooden stamps. Here's a closer look. We Robbie's also hung a few other things in the craft room: an old wooden tool holder (I found at an antique mall this summer) that holds my Powder Puff ink pads, the Splat clock he got me for my birthday a few years ago, and a plastic drawer organizer (that a friend gave me when she was cleaning out a garage several years ago) where I keep extra letters (chipboard, die cut, etc). Wow, that was a lot of catching up, wasn't it! Thanks so much, everyone, for continuing the conversation!